Day 2 of the 470 North American Championships, a pre-event for the Miami World Cup starting next week. New leaders in the men’s event, after two more races on Sunday, are Panagiotis Manti and Pavlos Kagialis of Greece, with the overnight leaders Anton Dahlberg and Fredrik Bergstrom of Sweden dropping to second place. Jordi Xammar and Nicolas Rodriguez of Spain now take third place. Best placed USA pair are Stuart McNay and David Hughes in 11th place overall. Best placed Brits are Martin Wrigley and James Taylor in 16th place, with Luke Patience and Chris Grube, who took a retirement in the fifth race, but then came back with a 7 and 5, to finish the day in 17th overall. In the women’s 470 event Camille Lecointra and Aloise Retornaz of France stretch their lead to 27 points ahead of Japan’s Ai Kondo Yoshida and Miho Yoshioka in second. Fabienne Oster and Anastasiya Winkel of Germany move into third place. Best placed USA pair Atlantic and Nora Brugman slip down to 11th place overall. Britain’s Hannah Mills and Eilidh McIntyre did not compete and drop to 21st place. 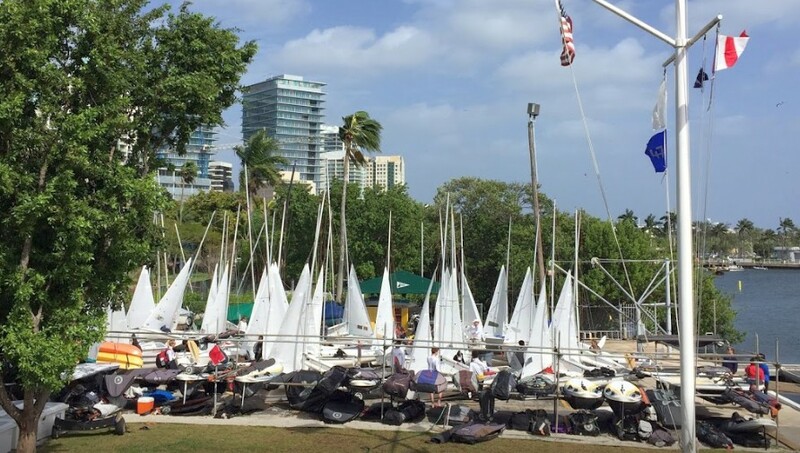 The championship is hosted by the Coconut Grove SC, Miami, Florida. The Hempel World Cup Miami Regatta will take place from 27 January to 3 February.